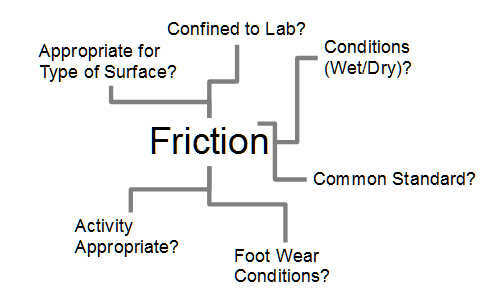 6 Questions to consider when including friction levels in specifications. | ASET Services, Inc.
6 Questions to consider when including friction levels in specifications. Question Number 1: Can the test be performed in the lab and in the field? It is my opinion that the specified friction test should be applicable to both the lab and field setting. Tests that are confined to the lab prevent owners and manufacturers from directly verifying that the product was properly installed and that it meets the specification. A field test allows the the surface to be evaluated in the conditions present and to remove any contaminants until the actual sport surface is installed. We’ve used field testing to determine that extreme levels of dust and dirt have altered friction. We’ve often found that residue from cleaning compounds prevent the sport surface from properly performing. Test methods confined to the lab do not allow such testing. Question Number 2: Is the test appropriate for the activity that the product will be used for? Again, its my opinion that the test should have been developed with some focus on the activity that the surface will be used for. Friction tests developed for walkways may focus on static friction or wet friction while a sport surface may need to be focused on rotational or dynamic friction. Surfaces can have very different static and dynamic friction levels. We recently compared two surfaces where one had a higher static friction level and the other had a higher dynamic (skid) friction level. Question Number 3: Is the test appropriate for the shoes or foot wear conditions that will be used? As an example, will the be used barefoot, wearing athletic shoes, or wearing shoes with cleats, or as a general pedestrian shoes. A surface installed around a pool could use a friction test that makes some attempt to simulate a barefoot user. Likewise if the surface is going to be used for sport, the friction test should seek to simulate the materials in a sport shoe. Some widely used tests use a leather sole to measure friction. Even the kids in ‘Hoosiers’ wore rubber soled basketball shoes. I always question the use of a leather sole to evaluate a sports surface. Question Number 4: Is the test appropriate for the type of surface being specified? There is nothing inherently wrong with using a method that was developed for a different surface or application. ASTM E303 is one such test, and it was developed to test skid properties of airport runways. However over the years the standard was modified for use on other surfaces. Scientists and engineers developed new rubber compounds for the slider used in E303 that make the results applicable for sports surfacing, and it can even simulate barefoot conditions. Tests developed for walkways or other areas may be valid, but any acceptable performance should be verified and validated by the industry using it. Question Number 5: Is the test appropriate for the conditions present? Specifically I mean will the surface be used wet, dry or both? Generally indoor sports surfaces are only used when dry, so testing of wet surfaces is rarely performed. However, an outdoor track is used in both wet and dry. In such cases the slipperiest condition is when the surface is wet. As an example, the IAAF places requirements on the wet friction of certified Track and Field surfaces, and makes no mention of dry friction requirements. Some standards clearly state in their scope, “Results are only applicable on dry surfaces.” In this case generating a wet friction level goes beyond the scope and intention of the standard test method, and may supply misleading information. Question Number 6: How common is the standard? New standards have the possibility to improve the performance and safety of surfaces. They also have the ability to confuse the market place, and to create what are in effect proprietary specifications. Occasionally we see a little known standard used in a friction specification. We often get calls asking us how to convert the friction from one test to another. Normally there is no known conversion. The answer to each question is subjective, and while I have my opinions, they are simply my opinions. Manufacturers and specifiers should understand how the chosen standard is meant to be used. ASET thinks these questions can help guide manufacturers and architects to develop better and more meaningful specifications that serve manufacturer’s, installer’s, architect’s and owner’s best interest. Contact us for any friction testing you may need for your sport surface.